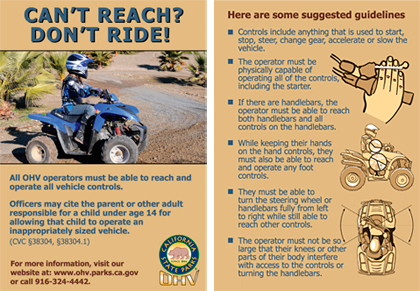 (a) Neither a parent or guardian of a child who is under 14 years of age, nor an adult who is authorized by the parent or guardian to supervise that child, shall grant permission to, or knowingly allow, that child to operate an off-highway motor vehicle in a manner that violates Section 38304. (1) For a first conviction, the court shall impose a fine of thirty-five dollars ($35). (2) For a second conviction, a fine of not less than thirty-five dollars ($35) nor more than fifty dollars ($50).